The armor on the game case looks cool. However, it provides no benefit of any kind. It is a unique NCR combat armor for the NCR Rangers. It also doesn’t appear until you reach a certain point in the main quest — a condition is met. I think it has to do with the OS upgrade to Mr. House’s securitron’s or secret army. So, I’m not convinced it is tied to character level. Power Armor isn’t widespread until you reach a certain point in the Brotherhood of Steel sidequest. All of a sudden NCR soldiers will be seen wearing Power Armor. No training is required to wear their armor and their armor provides no benefits. It’s kind of pointless. These two short paragraphs are to help you realize one thing. Armor scales to the world around you. If you put off the main quest until you are level 20-something, the cool looking NCR Ranger Combat Armor won’t appear. If you never deal with the Brotherhood, Power Armor won’t be seen. The other annoying issue with armor involves faction reputation. Putting on the uniform of a faction negates your standing. Everyone will be neutral towards you except for named NPCs that can see through your disguise. That alone makes wearing some armor (like the cool NCR Ranger Combat Armor) pointless. Your reputation drives how the world reacts to you. You worked hard for it. You should reap the rewards. If NCR loves you, they should still love you when in their uniforms. It just doesn’t happen that way. You’ve cleared Camp Searchlight of the ghouls and can’t access the Police Station or Fire Station. A key is required to enter. This is because access is tied to a side quest. There are two churches in town. The one closest to the NCR camp is your destination. Enter the basement and speak to the mercenary leader below. This will initiate the sidequest. Enjoy. Overall, disappointing. The story for single player campaign was interesting. I liked the whole brain-washing angle and time period. However, the A.I. needs work. Several times during the campaign A.I. soldiers would take cover in the same spot I chose. They often got in the way. I had the same problems with Medal of Honor. The whole campaign is run-and-gun. There is no requirement to clear an area. The only objective is to reach the next “waypoint”. In that sense, everything happens fast and you barely get to enjoy the game. It would be nice to have one mission where the enemies didn’t respawn and you could actually judge your progress. This was missing. The zombie arcade game is fun for about ten minutes. You get to laugh at the whacky lines and enjoy some mindless “killing”. Then you start to notice the limitations on weapons and ammo. I’ve made it through 7 rounds max. Most of the time I wind up being over-run. Maybe you have better luck 0r skill. It doesn’t matter. It just gets old quick. I’m so glad I rented this game. Believe it or not, you can acquire this outfit early. Head east on the road leaving Goodsprings until you discover Jean Sky Diving. Enter the building and look around. You should find a unique bottle cap. It has a blue star. Pick it up. This simple act triggers the Malcolm Holmes event. Malcolm Holmes will approach you in the wasteland and explain he’s been following you. His sole function is to explain the caps with blue stars. That’s it. This is good news. It means you can “sneak kill” him for his Roving Trader outfit and not suffer any bad karma. The Roving Trader outfit and hat boosts barter for a total 10 points. Enjoy. It’s possible that you don’t want to start the game with a weak character and are looking for some way to gain experience rapidly. Unfortunately, the update nerfed all of the experience glitches and you will have to grind. That leaves only one question. What is the best way to rack up some experience? Hunting. Hunt the Bighorner Bull. Each kill will reward you with 50 experience points. That is the same reward for Deathclaws and a whole lot safer. Find the herds near the following locations: Grub ‘n Gulp Rest Stop, Snyder Prospector Camp, Southwest of Wolfhorn Ranch, North of Nipton, and Spring Mountain Ranch State Park. You can also hunt the fire ants at the Ant Mound and El Dorado Dry Lake, the ants at Ivanpah Dry Lake, and the radscorpions south of the Nipton Road Pit Stop. The herds and ants will respawn after waiting 72 hours. Alternatively, you could just go after Fiends and Viper gang members. The point reward is 20 for each kill. The bonus is looting the dead. 03. Highlight the item you wish to repair. 04. Press triangle. Any item you may use to repair will be listed below. 05. Highlight item to use for parts and Press X. There are two types of “items” you may repair — armor and weapons. In Fallout 3, repairs were based on your Repair skill. If you had 20 for your repair skill, you could only complete a 20 percent repair. In New Vegas, repair works differently. If you have 20 points in repair, you can repair an item adding 20 percent to its current condition. I’ll provide an example to help you understand. These are not exact figures — just an example. Repair: 30 — takes 13 of same item to get a full repair. Repair: 60 — takes 6 of same item to get a full repair. Repair: 90 — takes 3 of same item to get a full repair. Get the idea. You can make a full repair no matter what your Repair skill is. It only determines how good your repair efforts are or how many items it will take to make a full repair. If you have 50 points in your repair skill, you can craft weapon repair kits at a work bench. There are plenty of supplies around to make enough kits to last until you get the Jury Riggin perk. Make sure you are holding the weapon that needs to be repaired before using a repair kit. This is a no B.S. post. It will be short and to the point. If you are trying to figure out how to acquire good armor and a good weapon right away, read this. Make your way to Camp Golf and head into the resort house. Look right once inside. There is a room filled with cots where the NCR rangers sleep. There is a combat helmet and combat armor sitting on a shelf. You will have to steal both. Simply pick them up and walk into another room or out of sight of the rangers, drop the item, and pick it up. It makes stealing much easier. Now, the hard part. 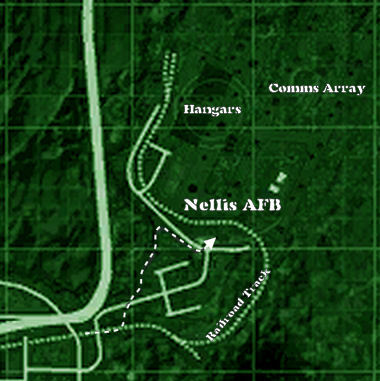 You can acquire an Assault Rifle and Marksman Rifle ealry in the game from the Nellis Communications Array. Two boomers are dead inside the building. The rifles are sitting next to them. What makes this hard is getting past the shelling. Follow the path indicated in the image below. The idea is to hug the ridge line until you reach the fence. If you get hung up along the way, you might not make it. Attemp to open the gate and respond to the sentry’s challenge. Speak with Mother Pearl and immediately speak with the female NPC that took you to her. She will give you the quest that provides the key to enter the array. You can also pick up combat armor off of two dead bodies at Durable Dunn’s Sacked Caravan.